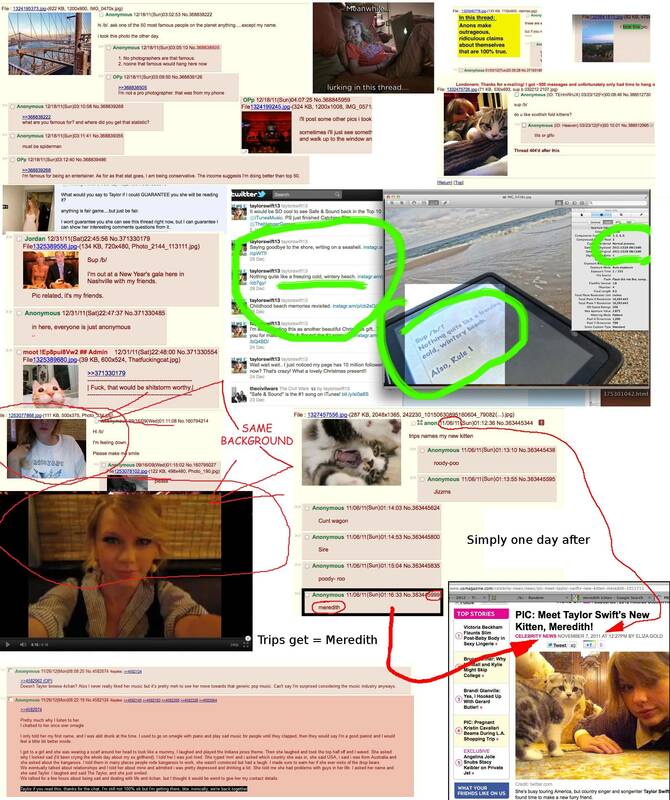 Taylor Swift is secretly lurking on the 4chan message board /b/, a new theory developed by users of the anything-goes image-sharing site claims. A user of 4chan’s /b/ message board compiled evidence that seems to suggest the 23-year-old pop/country singer has been secretly posting to the board and inviting users to find out her real identity. There are threads in which an unnamed celebrity who seems to be Taylor invites questions, and another that shows a user ask for name suggestions for a new kitten. The name Meredith is chosen, linking to a story in which Taylor Swift actually named her new kitten Meredith. So if Taylor Swift is browsing on 4chan, what is the big deal? After all, it’s one of the most popular and influential gathering places on the internet, the birthplace of memes and viral videos as well as splinter groups like Anonymous. The answer lies in a recent contest sponsored by a Boston radio station. The contest invited fans to submit reasons why they should meet Taylor Swift, with the person getting the most votes winning a real-life visit. A 4chan user started a campaign to vote for a 39-year-old “creep” named Charles Z., eventually getting enough votes to put him in first place. If Swift really were posting to /b/, then she would have known about the “Vote for Charles” campaign or possibly even participated, the conspiracy theorists say. A page listing all the evidence was submitted to Reddit on Saturday, quickly becoming one of the most popular submissions. It generated hundreds of comments, most of them ranging from shock to skepticism. While there is much evidence to suggest that Taylor Swift is a 4chan user, it is presented in a way that would be confusing to anyone unfamiliar with 4chan’s post format. Many have pointed out that the evidence suggesting Taylor Swift is a 4chan user is far from conclusive. The pictures posted by the person alleged to be Taylor are all publicly available online, and the anonymous nature of the site would make it easy for someone to claim to be the pop star, they point out.